The Green Star Elite Deluxe Jumbo Twin Gear Juice Extractor with Pasta Maker Set (GSE-5300) can do it all. When I say “all” I am talking about its ability to make pasta, bread sticks, baby foods, nut butters, grinds grains, grind nuts, and sorbets. Oh, did I forget to mention that it is also a juicer? Not to many people have heard of Green Star, but they are one of the best juicer manufacturers. 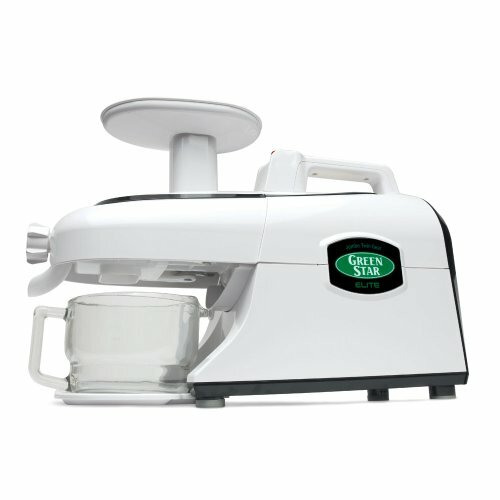 The Green Star Elite Deluxe Jumbo Twin Gear Juice Extractor auto-ejects the pulp, so you can run it non-stop. This juice extractor can run continuously, and can be used commercially. It is extremely easy to clean and put together. If you use the Green Star Elite to make pasta, you can make spaghetti and fettuccine. It comes with those two settings. You are out of luck if you want to make a “fancy” noodle. But, if you are gluten intolerant, and want to make your own gluten-free pasta, you can. The same is true for baby foods and sorbets. You are in control of what you and your family eats. Why not make sure that they get the highest quality foods as possible. Is the Green Star Elite Deluxe Jumbo Twin Gear Juice Extractor the “end all” solution for you? You can juice wheat grass with this machine. It will easily handle ginger, carrots, celery, rhubarb, and kale. This juice extractor is very quiet and features a twin gear juicer assembly. It features a 5 year warranty.